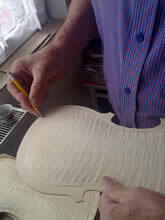 Check details, look at photos and read reviews on the Register of New Instruments made for Martin Swan Violins. Does it make great music? Does it inspire you to new heights? Does it bring fresh ideas to your performance? Does it make you want to play? Our aim is to produce quality of tone using traditional forms and working practices, without the prohibitive price tag of “named maker” instruments. 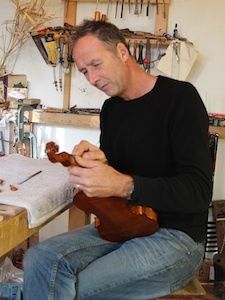 A fine violin needs great wood, a good model, individual thicknessing, successful arching, and a supple varnish … easy to say, but surprisingly hard to achieve! Our craftsmen belong to the Hungarian minority in Reghin, Transylvania – they use hand tools to reproduce classic Cremonese patterns by Stradivari, Guarneri and Guadagnini. Each violin is made entirely in the white by a single luthier, finished in oil varnish by a specialist artisan in our Budapest shop, then set up and adjusted by a luthier who plays the violin to a high standard. In this way we maintain the quality of work at every stage of the process. After all of this, the violins are graded for sound and priced accordingly. Most are graded as “Standard” and are suitable for conservatoire students or advanced amateur players – they have excellent playability and a classic European sound. A few don’t make the grade and are offered as student instruments. Outstanding violins suitable for professional players are graded as “Artist” – we are particularly proud of these instruments. Artist violins are subject to availability. All of our part size instruments are handmade to the same exacting standards as our fullsize instruments, and they’re finished with the same oil varnish. We believe that young and growing players should be able to learn on instruments that sound good, but parents are generally (and understandably) unwilling to spend a lot of money on something which will only be used for a couple of years, so the standard remains poor. Our solution to this is to offer high quality new ¼, ½ and ¾ instruments with a trade-in guarantee. If you buy a small instrument from us and wish to upgrade after a couple of years, we will take it back and credit the full purchase price against a larger instrument. If the condition of your smaller instrument has deteriorated significantly, we will negotiate a trade-in price which is fair to you. If we don’t have what you want in stock we can have it made, although the waiting time can be 3-4 months. Email Martin (martin@martinswanviolins.com) to find out what we currently have in stock or to place an order. The world of stringed instruments is something of a nightmare for left-handed players, but when it comes to actually making instruments, it’s no harder to make a left-handed violin than a right-handed version. We provide new handmade violins, violas and cellos in left handed versions, and we don’t charge any more for them. 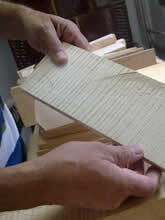 If we don’t have what you want in stock we can have it made, although the waiting time can be 3-4 months. 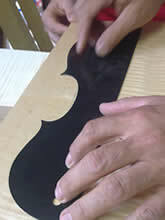 The only differences from right-handed instruments are that the bassbar and the peg-holes are reversed; in all other respects we exercise the same high standards in choice of wood and tonal grading. Professional orchestras will probably never open their doors to left-handed playing on grounds of aesthetics and safety – orchestral players are squeezed onto the stage in serried ranks, and a bow traveling in the opposite direction is clearly a health hazard. For this reason the classical establishment often encourages left-handed players to learn in a way which can disadvantage them. Not every left handed musician aspires to be a professional orchestral player, and we’ve found that there’s a significant demand for our left handed instruments. As with part-size instruments, if we don’t have what you want in stock we can have it made specially for you. Contact us if you would like to discuss commisioning a left-handed instrument. Our MSV instruments are played by classical and traditional players, professionals and keen amateurs. In tonal quality these violins are amongst the best handmade instruments currently available, and for a serious player they represent unbeatable value for money. You can read customer reviews here or, if you would like to hear someone playing one of our violins, you can try recordings by Jani Lang, Rona Wilkie, or Morag Brown – all 3 are great traditional musicians (one Hungarian, two Scottish). Perhaps you feel you can’t learn anything about the quality of a violin unless it’s Paganini, in which case … just enjoy the music!